Salman Khan will have to stay in Jodhpur Central Jail another day, as the Jodhpur Sessions Court delayed until tomorrow an order on a bail plea by the actor. The actor was yesterday convicted and sentenced to five years in prison for killing two blackbucks in 1998. The Bollywood star spent last night in Jodhpur Central Jail. Yesterday, his lawyer HM Saraswat filed a bail application in the sessions court immediately after the sentencing, and on the same premises. Saraswat said an appeal against the conviction too will be filed soon after going through the verdict. In the judgement convicting the actor yesterday, the court said he’s a role model for millions and should have been more careful. “The accused is a popular actor whose deeds are followed by people. Despite this, the accused hunted two blackbucks,” said chief judicial magistrate Dev Kumar Khatri in his written judgment. 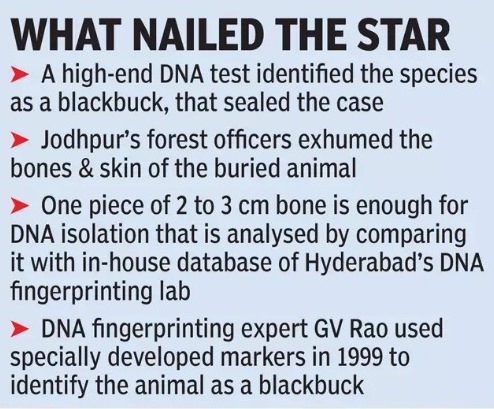 The verdict in the case came 20 years after the actor’s infamous blackbuck hunt made national headlines. Salman’s co-stars Saif Ali Khan, Tabu, Neelam and Sonali Bendre, who allegedly accompanied him on the hunt on the night of October 1-2, 1998, were given the benefit of doubt and acquitted. All of them were camping in Jodhpur at that time for the shooting of “Hum Saath Saath Hain”. The defence lawyer had pleaded for leniency for Salman under the Probation of Offenders Act. But the judge denied any benefit, saying cases of illegal hunting were on the rise. The court found Khan guilty under Section 9/51 of the Wildlife Protection Act and also imposed a penalty of Rs 10,000. This was the third poaching case against Salman during the “Hum Saath Saath Hain” shoot. Lower courts convicted him in two other cases but he was subsequently acquitted by the HC. The Rajasthan government had appealed against Salman’s previous acquittals and two cases are pending in the SC since October 2016.